Pua Leahi Apartments were constructed in 1971 by a group named Hiki-No Investors and it's one of the younger buildings at Pualei Circle. Pua Leahi Apartments are three stories tall with 30 units, all two-bedrooms with two baths. Interior sizes range from 660 to 795 square feet. Lanais are 87 to 172 square feet in size. Amenities - This is the only building with an elevator at Pualei Circle. 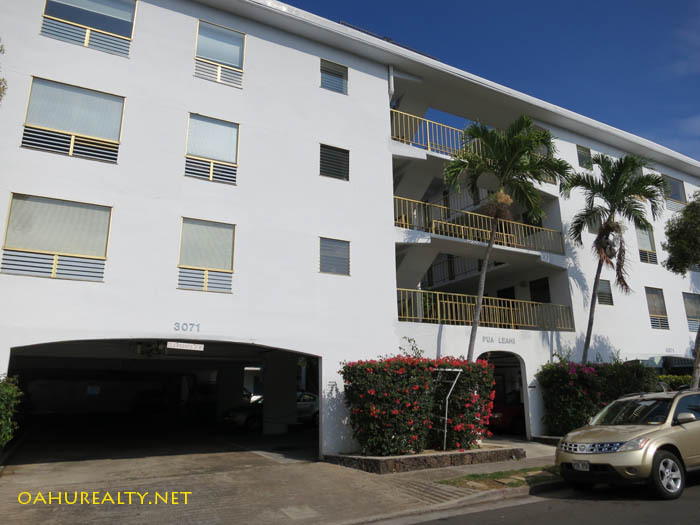 Pua Leahi Apartments have a patio deck on the top floor and covered parking. Units on the sides of the building (numbers ending in 1 through 4 or 7 through 10) have or are plumbed for washers and dryers. The end units (5 and 6) are not setup for washers/dryers. The building has a community laundry at the ground level to serve residents who need laundry facilities. Some units have two parking spaces (a rarity in Honolulu). Note - Pua Leahi Apartments do not allow pets, except for service animals. Owner Occupancy Rate - 50% according to Association documents. 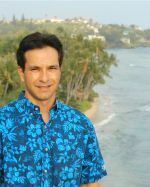 Enclosed Lanais - owners may apply with Pua Leahi Apartments' board of directors to enclose their lanai. Pua Leahi Apartments are located at 3071 Pualei Circle. Take Leahi Avenue and make the turn into Pualei Circle to visit Pua Leahi Apartments. View and download Pua Leahi Apartments house rules here.